Employees State Insurance Corporation ESIC invites Application from all the Indian Citizens for Specialists Grade-II Posts. It is Golden Opportunity for all the interested applicants who are looking for jobs in Employees State Insurance Corporation & are eligible to apply for these Specialists Grade-II Posts. 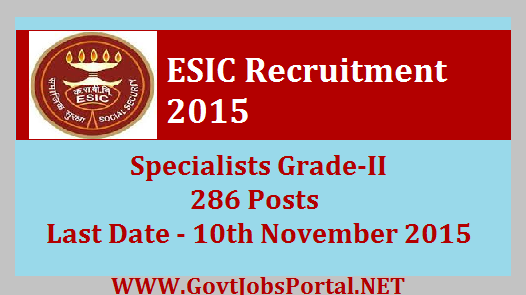 All the Interested Applicants can apply for this ESIC Recruitment process till 10th November 2015. Below in this post we are providing you the complete details regarding this Recruitment. Read the complete detail carefully & apply for the required post if you are eligible to apply. Academic Qualification: Check official Advertisement for complete detail. Age Limit: Applicant Upper Age Limit should be 45 years. Selection Process: Applicants will be selected on the base of Interview by ESIC.